Although much of Paris acted like a normal city today (see: opened its stores on a Sunday... gasp! ), I avoided the holiday shoppers and opted for the Rodin museum instead. The weather was crappy and the apartment felt sad; plus it's the first Sunday of the month, which means that many museums in Paris were free. I LOVE the fact that museums are free once a month and if you choose carefully (see: avoid the Mona Lisa AT ALL COSTS), you can usually enjoy your visit without feeling as if half of all Parisiens are breathing down your turtleneck to get a look at the art. I would suggest that this free tradition come to New York, but I have a hard time believing that a city that hosts the Bodies exhibit and charges $27 per person WITHOUT student prices would ever embrace such artistic generosity. Other than Target nights at the MOMA, I can't think of any other museums as visitor-friendly as those in Paris. 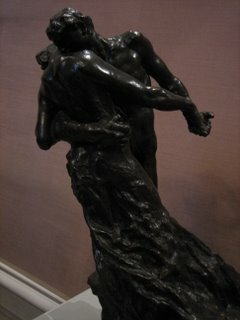 Of course, I really liked the Rodin statues, but I was blown away by some of Camille Claudel's work. In case you're not up to speed on your French sculptors, Camille Claudel was Rodin's student, friend, and lover (... and 24 years his junior but who's counting?). She seems like a crazy cat, that Camille Claudel, and I mean that in a literal sense- her father was the only one in her family who supported her career choice and her mother had her committed to a mental institution eight days after her father died. It was apparently a break-up with Rodin that pushed her over the edge, though I would suggest that the mother (who incidentally didn't visit her in the institution ONCE for the rest of her life) had a little something to do with it. Takes my breath away, Top Gun style.